3D printing, or additive manufacturing, is the fascinating process of transforming a digital file into a solid three-dimensional object. You can think of a 3D design file as a blueprint for an actual physical object – that’s pretty much the working magic behind 3D printing. If you are curious how exactly a 3D printer achieves this feat, then read on. Nowadays 3D printers have become viable products to be used by more and more customers as the prices have gone down and the technology behind their functioning keeps advancing. Hardly a week goes by without hearing about the amazing potential of these machines. They are capable of creating anything from simple scale models, clothing and all sorts of gifts, to more complicated stuff like prosthetic limbs and hearing aids. The technologies that 3D printers use can vary a lot. There are desktop printers that have the ability to melt a plastic material and then creating an object onto a print platform but there are also large industrial machines capable of selectively melting metal powder with a laser at very high temperatures. The printing process may be quite lengthy in duration, it can take many hours depending on the size of the project and usually, there is a special treatment that needs to be done to completed items to reach the desired finish. A reasonable amount of variety can also be found regarding available materials used for 3D printing. Considering the printer type they can range from plastics to sandstone, rubber, metal and alloys with lots of new materials constantly hitting the market every year. This article mostly focuses on those common 3D printers intended for the consumer market. These are the machines that appeal to hobbyists and designers and such but before that, let’s look at some other methods used in 3D printing. Since the late 1970s, several processes have been invented. Some methods use a light source to solidify a liquid material. Examples are Stereolithography (SLA) and Digital Light Processing (DLP), both are creating 3D printed models from a liquid-like resin (a photopolymer). SLA uses a laser while DLP employs a projector. In order to create a 3D printed object the first step is the submerging of a build platform into a translucent tank containing liquid resin. Then a light inside the machine, like a laser, maps each layer of the object and solidifies the material. 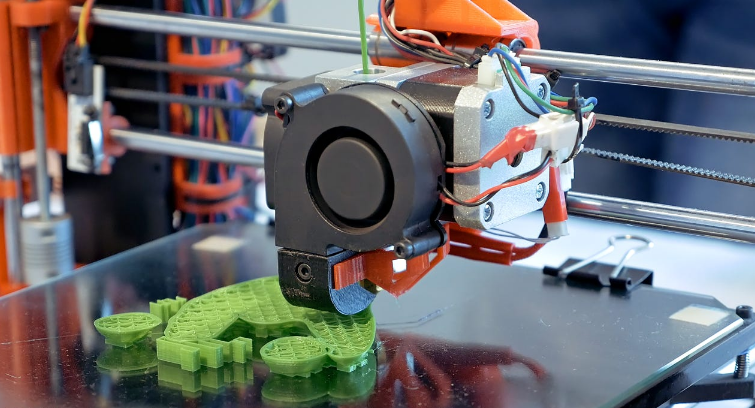 These 3D printing technologies can be found in desktop 3D printers. They are exceptionally good at producing highly accurate items and are commonly used for extremely detailed sculptures and prototypes but their small size does not recommend them for printing big objects. 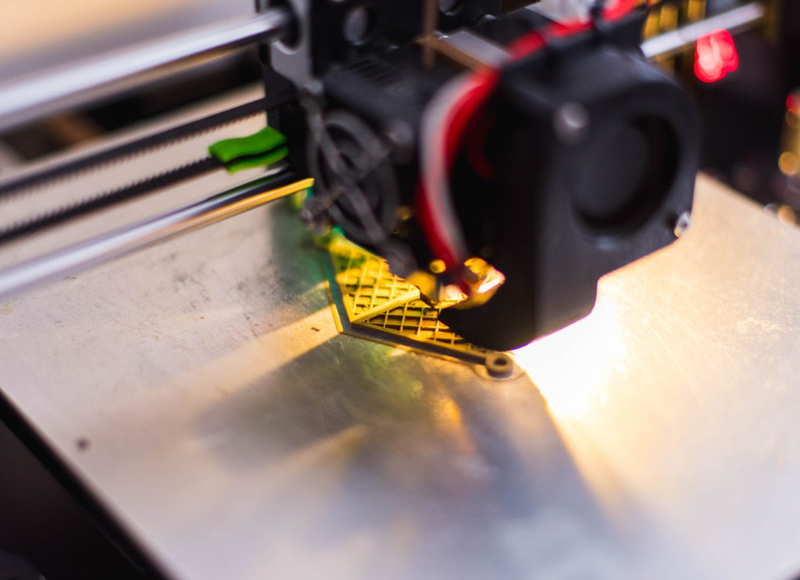 Another method used in 3D printing is called Selective Lasers Sintering (SLS) which solidifies layers of powdered material using a laser to form physical objects. With the help of a laser, successive layers of plastic, metal, glass or ceramic are melted. SLS is mostly employed in industrial 3D printing applications. The technology is rather in its incipient stages on the desktop market but the first versions have appeared and its popularity is expected to rise further into the mainstream. One great advantage of laser sintering is the freedom when it comes to designing thanks to the fact that the excess unmelted powder can act at the same time as a support for the entire structure as it is produced. Therefore you can manufacture some intricate designs without the addition of extra support. The drawback is that finished objects will require more time to cool and as a consequence of that, the entire process takes a considerably longer amount of time. Considered the most precise technology for creating realistic prototypes with amazing details and smooth surfaces, Material Jetting is a 3D printing process that looks very promising. PolyJet and MultiJet Modeling technologies draw some similarities with the standard inkjet printing but these 3D printers don’t jet drops of ink onto paper. These machines use UV light to instantly cure jetted layers of liquid photopolymer onto a build tray. To provide support for more complex shapes, the printer jets a removable gel-like material that acts as a temporary support which can be removed after the object is finished. This 3D printing method is reserved to industrial printers and makes use of liquid photopolymers, a material which adds interesting properties to a completed item including flexibility, toughness, and transparency. Because of the incredible printing resolution of up to 16-micron layers which is basically thinner than a human hair, this technology is the most precise when it comes to 3D printing. Other industrial 3D printing processes, named Selective Laser Melting (SLM) and Electron Beam Melting (EBM) are used for printing using various metals and alloys. They require a high power laser because of the higher melting point of metals. An SLM or EBM machine works by distributing a layer of metal powder onto a build platform which is then melted, in the case of an SLM by a laser and by an electron beam for an EBM printer. Along the materials used for these technologies are steel, titanium, nickel, cobalt-chrome and aluminum. Metal printing is definitely the ultimate additive manufacturing process as it has many applications for aircraft, aerospace, automotive and healthcare industry. If you were wondering about the possibility of printing an object in full color well, it’s actually possible thanks to the binder jetting technology. It’s very similar to the SLS process but uses a binding agent that gets extruded from a nozzle to bind the powder together as opposed to using a laser that simply sinters the layer together. This is yet another industrial method and has its own ups and downs. It commonly uses sandstone as a material which although is more affordable than using a laser, the resulting objects are much frailer and not as strong comparatively. Because of this, binder jetting is mostly used for architectural models and lifelike sculptures. A method that looks extremely promising for the healthcare industry is the 3D bioprinting which is the process of printing tissue-like structures using cell patterns. An important aspect of this is regarding the cell function and viability which have to be preserved within the resulting construct. It’s quite obvious that multiple applications can be found in medical and tissue engineering fields. At this stage, the technology is a bit far from printing an actual organ replacement but 3D bioprinting is currently used to print tissues and organs to be used for researching new drugs and pills. Additionally, this 3D printing process can incorporate the printing of scaffolds that help to regenerate joints and ligaments. The most common technology used for desktop 3D printing, favored for quick and low-cost production, is the Fused Deposition Modelling (FDM) printing process. By extruding small beads or streams of a material which forms layers by hardening immediately, a model can be shaped with decent precision. This basic operation remains the same even if sometimes there can be differences between FDM 3D printers. 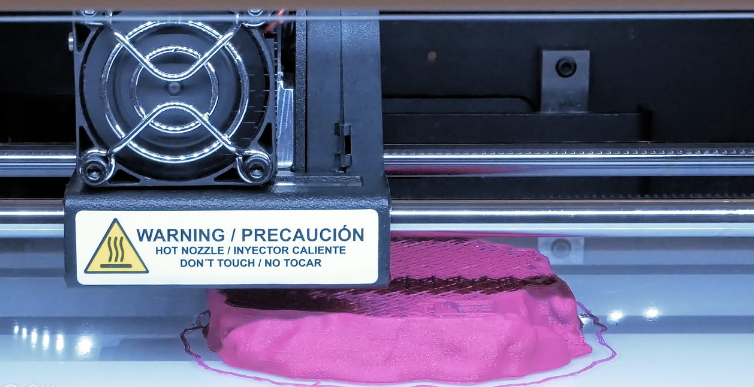 The popularity of this process is due in part to the RepRap open-source 3D printing movement, which helped kickstart the creation of capable software and hardware for 3D printers. Now that we analyzed the most important 3D printing methods used in present times, in the next sections we’ll take a look at each essential component of an FDM printer and what’s its role in the printing process. One common aspect for all 3D printers is the way they rely on CAD (computer-aided design) files to print any physical objects. Models created using a CAD package are less prone to errors and can be corrected before printing to allow the verification of the design of the object before it gets printed. Similarly to plastic arts such as sculpting, 3D printing begins with a manual modeling process to prepare the geometric data for 3D computer graphics. 3D printers are controlled by a computer by using several programs and usually, the manufacturers already provide an optimized packaged bundle of software with their models. One kind of program that 3D printers make use of is called the slicer. It works by taking a 3D object file and “slicing” it into layers ready for printing. This process is done based on some parameters that can be set such as resolution – the height of the layer. Another print control software allows you to set up the distance correctly between the extruder and the build platform. It also lets you control the temperature of the extruder and manipulate it in 3D. The actual software work you have to do depends on how demanding is a project, in most cases the printing can be done in a much more straightforward way by just connecting the printer to a PC, loading the object file and pressing Print. Regarding the most frequent materials used by FDM printers, they are called polylactic acid (PLA) which is a biodegradable polymer and acrylonitrile butadiene styrene (ABS), a lightweight material with a strong impact resistance and mechanical toughness. These filaments can generally be found in 1kg spools for purchase and most commonly have a diameter of 0.07 inches. There is plenty of variation in the bodies of 3D printers. Some can be made from plastic and give a minimalist feel while others can come packed in sturdy metal frames. Expensive 3D printers usually have enclosed print areas and most lower-priced ones have an open frame. One advantage of an open frame is that you can see the process of printing much clearly but with this feature, the problem of extra noise can appear. Another downside of an open body is if you’re printing with ABS you need to keep the room ventilated because of the emanating fumes which are known to cause headaches for some people. In a 3D printer, the print head is represented by the extruder. It contains a nozzle that squirts the liquefied filament layering the model. Above the extruder, there is a melting chamber where the material is liquefied by a heating element. The filament is fed into the extruder through a hole at the top of the printer. For heat dissipation, a small fan may be included near the nozzle. This is where the object gets shaped. Also called a build platform, it can be usually as large as the printer’s build area. For adherence, it has to be treated with glue before printing which gets removed after the job is done. Some machines have heated platforms to reduce the tendency of warping of models printed with ABS thermoplastics. The movement of a 3D printer is done side to side, in and out and up and down by the extruder assembly relative to the print bed. This is required for the extruder to continuously deposit layers one by one. Motors on each axis and connected to belts control this movement for the process to proceed smoothly. There is a particular level of variation when it comes to the motion of different 3D printers. After you hit the print button the 3D printer moves into action. To achieve the required temperature, the melting chamber heats up. The extruder gets down to its starting position, placing itself very close to the print bed almost touching it. This proximity has an important role, it helps the first layer to adhere to the build platform. After the heating is done and the plastic has melted, the extruder starts depositing layer by layer instructed by the design file which it has received. This layer can vary in thickness and this is the factor which determines the quality of the printed object, called the printer’s resolution. A typical resolution is somewhere between 100 and 250 microns. It’s worth noting that in FDM printing, the objects are created always from the bottom up in successive layers. In case you decide to print multiple items they will get printed simultaneously. After the printing finishes and the extruder goes away, you can finally admire the completed object. Removing it from the build platform can get particularly challenging with some printers but some persistence will definitely pay off. Wow! Very well informative article about 3D printing. Keep up the great job Steven!